Its [British colonial education] cumulative effect was to be described…as nothing short of a chasm that…made it impossible for the new generation of the educated and the older generation of the traditional scholars to communicate with each other….It cut them off from their own traditions. By the same token, it also made their own past inaccessible to them as a history. Sad though it is, one result of European colonial rule in South Asia is that the intellectual traditions once unbroken and alive in Sanskrit or Persian or Arabic are now only matters of historical research for most â€“ perhaps all â€“ modern social scientists in the region. They treat these traditions as truly dead, as history. Although categories that were once subject to detailed theoretical contemplation and inquiry now exist as practical concepts, bereft of any theoretical lineage…contemporary social scientists of South Asia seldom have the training that would enable them to make these concepts into resources for critical thought for the present. She had told me to go to Lucknow. She had said that it was the city’s cultural and social heritage that had inspired her; compelled her; allowed her to create a unique form of Indian classical kathak dance that expressed the messages hidden in Sufi Islamic spiritual music and poetic verse. She was a high-caste Brahman Hindu woman (Chaturvedi, The Knower of Four Vedas), who devoted her life to the music and verse of Sufi Muslim saints and musicians because the cultural milieu of Lucknow permitted her to do so. She was unique, she said, but not necessarily novel. She was a pioneer, but carrying forward ideas and possibilities given to her by her ancestors. She was innovative, but worked from some of the most exalted and complex cultural and musical traditions India had ever produced. When I was first told about her I felt that she embodied in her life and art many of the ideals and ideas I was exploring in my travels, writings and photography. That heterogeneous, pluralist, accumulative propensity of India that produced remarkably beautiful and humanist realities. Its openness and sense of cultural strength that saw ‘the other’ as a source of creative possibilities, willing absorbing various traditions and heritages to produce something unique and far more than the sum of the parts. This openness so missing in the Europe I live in, where a defensive insecurity and paranoid fear of ‘difference’ so colors and constrains its society. This Europe that claims modernity for itself, but today seems trapped in exclusivist ideologies that compel it to fear the outsider, the different. General Outram: Have you ever seen a pigeon that has one black and one white wing? General Outram: Well now…. (reading a report) J. Khan the keeper of the royal pigeons received a kilat â€“ areward I suppose, huh? …of Rs. 2,000 for producing a pigeon with one black and one white wing. General Outram: I find this a very revealing document, Weston. Its an hour-by-hour account of the King’s activities, dated the 24th of January….thats yesterday. Did you know that the King prayed five times a day? Captain Weston: Five is the number proscribed by the Koran, Sir. General Outram: Surely all Muslims don’t pray five times a day? Captain Weston: Well not all Sir. But some do! General Outram: The King being one of them? Captain Weston: The King is known to be a very devout man, Sir. General Outram: Is he? …um….His Majesty listened to a new singer, Mushtari Bai, and …hah!….afterwards amused himself by flying kites on the palace roof! Thats at….4:00 pm! Then the King goes to sleep for an hour, but he is up in time for the third prayer at 5:00 pm. And then…in the evening….er…now, where is it….ah, yes, His Majesty recited a new poem on the loves of the ….bulbul? Captain Weston: A bird sir. The Persian nightingale. General Outram: I see…at a mushaira. Whats a mushaira? Captain Weston: A mushaira is a gathering of poets. They recite their new poems. General Outram: I see….Tell me Weston…you know the language, you know the people here….I mean….what kind of a poet is the King? Is he any good or is it simply that he is the King that the people say he is good? Captain Weston: I think he is rather good, Sir. General Outram: You do, eh? General Outram: Um…do you know any of his stuff? Captain Weston: I know some, Sir. General Outram: Well, can you recite it? Do you know it by heart? I am curious to know what it sounds like…I like the sound of Hindustani. Are they long, these poems? Captain Weston: Not the ones I know Sir. General Outram:Â .Well…go on then. Out with it. General Outram: Is that all? Captain Weston: Thats all Sir. General Outram: Hum…doesn’t strike as a great flight of fancy, I am afraid. Captain Weston: Doesn’t translate very well Sir. General Outram: What about his songs? He is something of a composer, I understand. Are they any good, these songs? Captain Weston: They keep running in your head Sir. I find them quite attractive, some of them. He is really quite gifted, Sir. He is also fond of dancing, Sir. General Outram: Yes, so I understand….with bells on his feet like nautch (dancing) girls. Also dresses up like a Hindu god, I am told. Captain Weston: You are right, Sir. He also composes his own operas. General Outram: Doesn’t leave him much time for his concubines, not to speak of the affairs of State……Does he really have 400 concubines? Captain Weston: I believe that’s the count Sir. General Outram: Ummm…and 20 muta wives…er…what the hell are muta wives? Captain Weston: Muta wives, Sir…they are temporary wives. A muta marriage can last for 3 days, 3 months of 3 years Sir. Muta is an Arabic word. General Outram: Ah..it means temporary? Captain Weston: It means….enjoyment Sir. General Outram: Oh. Oh yes…I see….hum…most instructive…..What kind of a King do you think all this makes him, Weston….all these accomplishments? Captain Weston: Rather a special kind, Sir, I should think. General Outram: Special? I would use a much stronger word Weston. I would have said…a bad King! A frivolous, effeminate, irresponsible, worthless King! …norms of sexual respectability were crucial elements of both British and German nationalism. People believed that their success as a nation depended on upholding ‘virtuous’ and ‘respectable’ norms of sexual conduct…The true man was not sensuous or pleasure-loving; he was duty-driven and self-controlled…Anyone who seemed too ‘soft’ or sensuous was branded as a ‘degenerate’, a label integral to the persecution of both Jews and homosexuals, who were believed to be subverters of the social fabric. The British called him effeminate. I find him evolved. The British mocked him as frivolous. I find him deeply engaging, serious and modern. They decided to cheat him of his crown, and betray his trust. He refused to raise the weapons of war against them and choose instead to appeal on the basis of justice and his rights. Some think him cowardly and weak. I can’t help but see eloquence and sensitivity. Can a set of traits be more anachronistic to an age, and our modern age, and yet seem so necessary? I am drawn to this dancing poet of a King. I am aware of his anachronistic nature, his flawed character, his weaknesses and failures as a ruler. But something about his talent, and pursuit of the beautiful, is seductive. He appears as supremely modern complex, nuanced, multi-faceted, cosmopolitan, talented, progressive, and a passionate lover of the higher achievements of human creativity. An European would admire him as a Renaissance man, and perhaps even offer him as a model to a new generation. He was a poet, an opera writer, a singer, an architect, a classical dancer, and a King. He sat atop one of the most sophisticated manifestations of Mughal culture that produced a sophisticated, complex, and syncretic cultural world. 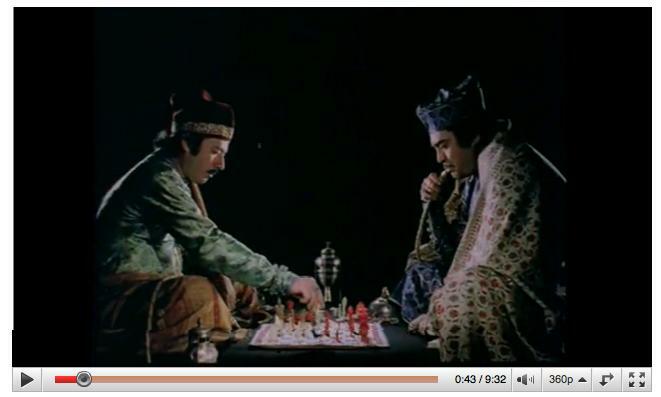 Question: In The Chess Players, the streets of the city are too unnaturally empty. Was the absence of crowds dictated by the budget? Ray: No. Actually, there were very few scenes shot on location. Lucknow, where the locations were done, has too many anachronistic elements, so we couldn’t use wide shots there. We had to be very careful to avoid electric poles and things like that….I didn’t show any main streets because of all the things that would interfere, like wall posters, motorcars, bicycles. It was not possible. Perhaps that’s a shortcoming of the film. As he was very interested in architecture he started to build Qaiser Bagh as soon as he came to the throne. His buildings…were certainly beautiful and splendid. Many kings have been interested in architecture but scarcely any other monarch can have built so many houses or established so many parks as Wajid Ali Shah during his unfortunate life and the short period of his so-called reign. I search for Qaiser Bagh and find nothing but hollow monuments. The grand buildings that once danced to the rhythms of a cultivated life, today stand silent, apart and out-of-fashion. Passerby barely glance at them. Those who I ask do not even know what they are. Graffiti marks the walls of the ancient mausoleums, litter decorates the small parks, dirt and spit color the delicate chhatris, hastily done ‘renovations’ scar ancient gates and buildings. Like unused decorative furniture, these monuments stand as a testimony to aspirations no longer relevant, and perhaps not even sentimental. The residential neighborhoods of the old city survive, the tightly placed homes, narrow winding streets, and the decaying havelis betraying some of the imaginings that were once living and relevant. But there is no coherence. Motley repairs are the modern aesthetic additions and renovations plastered over, boarded up, sheet-metal covered and cement and brick enhanced. Their elegance suffocating under convenience, affordability and modern efficiency. On a walk with a historian we come to a stop near a sewage gutter. He excitedly points towards the edges of the sewer and tells me that if I look carefully enough I will be able to see some of the original brickwork of the buildings of Qaiser Bagh – the Lakhauri. My heart sinks as I realize that I am searching for the last remnants of perfection next to a gutter! Once a year a great fair was held in the Qaiser Bagh to which the public was admitted and they could then see the voluptuous style of living to which the King was addicted. The King had seen the rahas, theatrical representations of Sri Krishna’s dance, and was so pleased with Sri Krishna’a amatory dalliances that he devised a drama about them in which he himself played the part of Kanhaya (Krishna) and decorous and virtuous ladies of the palace acted as gopis, milkmaid loves of Krishna. Sometimes the ardor of youth impelled the King to become a yogi. Pearls were burnt and the King would cover his body with the ashes. …the concept of culture has been neutralized to a great extent through its emancipation from the actual processes of life…The process of neutralization â€“ the transformation of culture into something independent and external, removed from any possible relation to praxis â€“ makes it possible to integrate it into the organization from which it untiringly cleanses itself…Today manifestations of extreme artistry can be fostered, produced and presented by official institutions; indeed art is dependent upon such support if it is to be produced at all and find its way to an audience. The dancer, a young girl, a novice? enters and takes her place. I look around for the musicians but see none. There is a sound of a cassette being dropped into its slot. Someone presses PLAY. The complex heritage of Indian classical dance, at the only cultural festival in Lucknow, will be presented by an indifferent kathak dancer tumbling her way through a recording! Caged in this location which once acted as a stage for great art, and that has today been reduced to a rent-able wedding hall, these ‘performances’ of song, dance or craft, were seemed not to belong to India. Dance in Lucknow developed strongly and became a pre-eminent art…Genuine Indian dance occurs when the movements of the body conform to and fit in with the treble and bass notes of songs and intoned poems. This evolved into a great art for which hundreds of new gats (instrumental compositions without improvisation) and torey (a complete cycle of one rhythm patter) were created. I stand in the darkness and watch the crowd gawk in confusion at the dancer. Soon my attention drifts towards the world outside these mourning walls. Out to the streets, where Lucknow’s modern frenzy continues unabated. The noise of the traffic, of screeching car horns, the shouting cycle-rickshaw drivers all fight the music. Indoors, the dozens of arts and crafts stalls set up around the dance performance hall distract the largely indifferent crowd from the largely indifferent performance. This is not a cultural festival, but a bazaar. Convinced that no one will participate in a real cultural performance, the organizers have fallen back upon consumerist seduction. The Indian corporate priorities have defaced the elegant facade of the Bara Dari with bright banners and corporate logos. Its luminescent white walls and flowing arches acting as merely hanging conveniences. I leave. Sharar started his work Lucknow: The Last Phase Of An Oriental Culture in 1913 and produced a unique, historically relevant detailed description of the range and evolution of Awadhi culture and its refinements. A ‘veritable anatomy of the social and artistic life of Lucknow…covering an astonishing variety of subjects’ that include: Education, Art of Combat & Self Defense, Urdu Poetry, The Art of Story Telling, Calligraphy, Animal Combats, Bird Fighting & Pigeon Fighting, Parrots & Kite Flying, North India Classical Music, Light Classical & Instrumental Music, Kathak Dance, The Art of Soz – The Chanting of Dirges, Bands & Processions, Gastronomy, Delicacies and Confectionery, Food Refinements and Water Cooling, Evolution of Men’s Dress, Forms of Headwear, Forms of Trousers, Footwear and Female Fashion, Building of Houses, Etiquette, Social Gatherings & Forms of Greeting, Festive Celebrations, The Wedding Ceremony, Funeral Services, Religious Assemblies, Betel Lea & Tobacco, Utensils for Everyday Use, Conveyances & Dress for Outings, Pottery. The sheer breath of refinement seems to belong to a completely alien world, not because it was in the past, but because indifference and a new set of values will not allow it to be replicated in the present. Our finest aspire to simpler things. At Deva Sharif I find solace. At this beautiful and delicate shrine on the outskirts of Lucknow, I enter a world thankfully of another time. As I sit in the main courtyard, amongst playing children and picnicking Hindu families, I sense that I am participating in a practice that dates back centuries to a time when we were neither Hindus nor Muslims. This fluidity, openness and accommodation was a hallmark of the Awadhi courts of the Muslim rulers which were staffed by a very large number of Hindu administrators, accountants, clerks in the revenue and finance departments and even commanders in the military. Members of the royal house participated in Hindu religious festivals. Awadhi rulers would personally intervene in financing and revenue issues that could disrupt important Hindu pilgrimages and gatherings. Their world view did not demand separation, and certainly did not demand oppression or negation of the other. Here, sitting in the embrace of Syed Waris Ali Shah’s beautiful shrine, a sense of calm slowing enveloping me, I try to imagine how natural, unthinking it must have been. The ease with which these boundaries that so seem to divide us were breached. I watch a steady stream of Sikhs, Hindus, Muslims and the curious, enter, pray and loiter around the shrine. Four elderly Sikh men are distributing prasad to anyone walking by. A Hindu family has returned to the shrine to make another offering as a thanks to an earlier wish fulfilled. On one corner of the main tomb a group of qawwals are taking a break, and counting their collections. Their gold-rimmed sunglasses and silk coats giving them the air of celebrities or pop stars. Men enter and leave an Imambara behind the shrine, while mothers and children relax. Shrines are centers of social gathering and family outings – and music. There is always the music. If it isn’t coming from the qawwals, then it is a local band hired by a group of pilgrims, or the melancholy sounds of someone lyrically reciting verses from the Koran. The shrine is a sanctuary. You don’t need to perform any rituals here, nor pray or make offerings. You don’t need to belong to a particular cult, sect, theology or creed. There are no other places like it in the world where one is reminded that our differences are so easily overcome, over divisions erased, and our suspicions allayed. The Sufis erased ethnic, religious, caste and class boundaries and stretched their minds and poetry towards the essence of the divine. Their words, poems, and message could never be contained within one religious tradition. Their ideas of the divine, ideas unique to India’s heritage, crossed not just the human sphere, but the divine as well. Love is inaccessible, incomparable, immeasurable. It is like ocean â€“ He who comes to its shore will not go back. When he drank the wine f Love, Varuna became the Lord of the Waters. These are the words of Ibrahim Khan, better know as Ras Khan. A Muslim he was perhaps the most famous of sixteenth century Uttar Pradesh’s Vaishnavite Sufis and venerated to this day for his compositions in praise of Krishna and his love for his gopis (friends, followers, lovers). Yogindar Sikand, in his book Sacred Spaces: Exploring Traditions of Shared Faith in India, describes Ras Khan’s most famous work, written in Brij Bhasha, the Premavatika. Fifty-three verses of this work take the love of Radha for Krishna as the ideal. Ras Khan had fallen in love with the son of a Hindu man, but his love offended the orthodox, who mocked and shunned him. When one day he confronted one of his torturers in anger, his victim begged for mercy and told him that if only he loved God as he does this boy, he would find true salvation. Ras Khan was moved, and found his way to Brindavan where, after three days of fasting, Krishna appeared before him and accepted him as a disciple. And he was one of many who did not search for difference, but rather attempted to find the shared. As I read about Ras Khan I receive an email from Manjari Chaturvedi. She is exploring new avenues in her dance and putting together a new piece that she calls the Radha Raas – the dance of Radha for Krishna. What excites me is that she reveals that during her research for this new work she discovered that so much of the poetry she wanted to use for the performance, poetry in praise of Krishna, was actually written by Muslim poets. She speaks of Mushtar Khairabadi from Khairabad, Rashid Safipur from Unnao, Nawab Sahab Rampur Syed Raza Ali Khan, Ustad Qayam Khan and Ustad Aqeel Ahmad Khan Saheb and perhaps the famous poet Raskhan. Her team of Muslim musicians, many from Deva Sharif, are now practicing the new music, singing in praise of Krishna, words that their Muslim ancestors composed in moments of devotion and love. …one result of European colonial rule in South Asia is that the intellectual traditions once unbroken and alive in Sanskrit or Persian or Arabic are now only matters of historical research for most â€“ perhaps all â€“ modern social scientists in the region. They treat these traditions as truly dead, as history. It may be useful to contrast Indiaâ€™s lived experience of pluralism with contemporary Europe, especially as the latter tries to renovate its faded ideals of secular citizenship while longing for its old cultural uniformity. The secular liberalism of the nation-state has demanded conformity and obedience from Europeâ€™s citizens. Upholding an abstract idea of the individual citizen divested of his religious and ethnic identity, this liberalism has not had an easy relationship with Europeâ€™s ethnic and religious minorities, to put it mildly; the current obsession with Muslims, for instance, betrays a deep unease with expressions of cultural distinctiveness (previously exemplified in Western Europe by Jews). The rise of right-wing parties across Europe shows that masses as well as elites are embracing majoritarian nationalism, recoiling from what, by Indian standards, seems a very limited experience of immigration, social diversity and political extremism. It is India that is the exemplar of pluralism, secularism and tolerance. These values are inherent in every epoch of it’s history and remain so today. It has to be excavated because what lies underneath layers of indifference and ignorance is modern and necessary. She had asked me to go to Lucknow, but I did not quite understand why until now. It wasn’t the city that I was supposed to see, it was its legacy that though may not be evident in its architecture or its neighborhoods, but lives in song, dance, poetry, etiquette and literature. It manifests itself in its daily rhythm of its people, its streets, and the lives that unfold there each day. Some three weeks after I first traveled there I watch her prepare for a performance in Delhi. She has the air of a goddess – one worthy of an heiress of a grand tradition – the kathak dancer of Lucknow. Her musicians, all from the area around Deva Sharif and passionate devotees of the Muslim Saint, discuss the final details of their compositions and dance. They are intimately familiar with each other’s world – she of their Sufic sensibilities and spirituality, and they with the meaning, imagery and nuances of her dance. To my untrained eye their discussions seem perfunctory, but I also know that they have developed an understanding over the many years spent practicing and performing together. Not much needs to be said, but all is understood. Later as I watch her dance – spinning, her eyes and hands and her musician’s voices reaching for the heavens, I can’t help but wonder if she is the last breath of the defeated or a reincarnated child’s first cry?